Extraordinary Island talent was on show at Quay Arts’ Anthony Minghella Theatre last week. 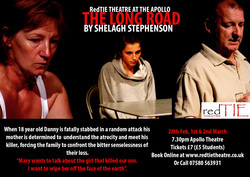 RedTIE Theatre’s performance of The Long Road was a powerful, harrowing piece of drama that brought tears to the eyes of more than one member of the audience. Shelagh Stephenson’s script deals with a family’s grief following the fatal stabbing of 18-year-old Danny. The director was Joe Plumb, one of several brilliant youngsters involved in the performance. The RedTIE group runs workshops for young people, encouraging creativity and self-expression through drama. With its productions, it aims to raise awareness of social issues. One of the organisations backed by RedTIE is Help2Grieve, a new group to help bereaved children and families. With knife crime constantly in the news, The Long Road takes a long, hard look at how it affects those left behind. Helen Reading, RedTIE group leader, was utterly convincing as Mary, Danny’s devastated mother, who is driven to try and understand why her son was killed by a young stranger. Her real-life husband, Steve, gave an equally strong performance as Danny’s father, John, who tries to deal with the loss by running and drinking. Danny’s brother, Joe, was played by Henry Vince, a former Carisbrooke High student, now studying drama at Exeter University. He had witnessed the murder, which he recounted in an incredibly moving monologue at the opening of the play. The killer, Emma, a damaged, drug-taking teenager, had stabbed Danny late at night, when he refused to give her money. Superbly portrayed by Katy Rawlinson, a Carisbrooke High student, Emma is cocky, gobby, foul-mouthed and slightly pathetic. A prison therapist, Elizabeth (Maria Wilkinson), arranged for Mary to visit Emma in prison and, though her first visit was a disaster, a turning point came when Emma admitted she did not mean to kill Danny and she did not read Mary’s letters because she was illiterate. Although Mary and Joe cannot forgive her, they start teaching her to read. By the end, the family is on its way to recovery and Emma is starting to turn her life around.